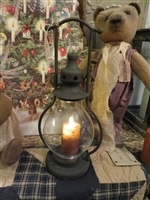 Farmhouse & Country Primitive Lanterns make beautiful additions to colonial, country, Americana, and primitive décor. Our lanterns pair perfectly with our flameless candles in homespun colors to brighten up your home. We carry a variety of lanterns in different shapes, styles, sizes, and colors, including white, black, and galvanized metal, to match any color scheme. They can be hung or simply placed throughout your home. Lanterns and flameless candles make great alternatives for homes with children or pets and will not burn little fingers or paws! 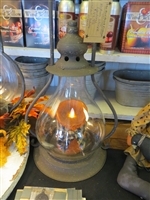 To purchase one of our country primitive lanterns, visit our retail location or browse our online inventory.